St. Luke School continually strives to provide every student with the best possible education, preparing all students to function effectively in the society in which they live. Therefore, we believe that all students must develop competencies in using and applying a broad range of technologies and media to support lifelong learning. 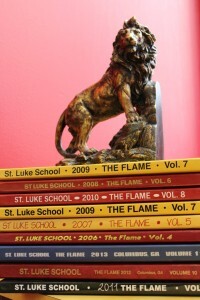 St. Luke School’s vision – as it relates to the Media Center – is to aid its students in becoming skilled, knowledgeable, independent, and self-directed learners who are comfortable with and proficient in using technology and media in all its forms as information resources. Through the use of technology and media, with its varied aspects and applications, each student at St. Luke School will be afforded opportunities and challenges that will allow them to successfully engage the future. Please refer to the list below for links that may be helpful to parents and students. Login information for those that are subscription-based can be found in ParentsWeb. If you have any questions about the Media Center, please do not hesitate to contact me at ahutchens@stlukeum.com.